You would think that driving on those long Arctic roads would be easy. Apart from the monotony of long straight roads, there is always the risk of 'traffic jams' due to the wildlife. Unlike normal farm animals, the reindeer are more-or-less allowed to wander completely freely. This means they can stray onto the roads. Occasionally it is just one or two, but sometimes the whole herd decides to stroll along the main road. 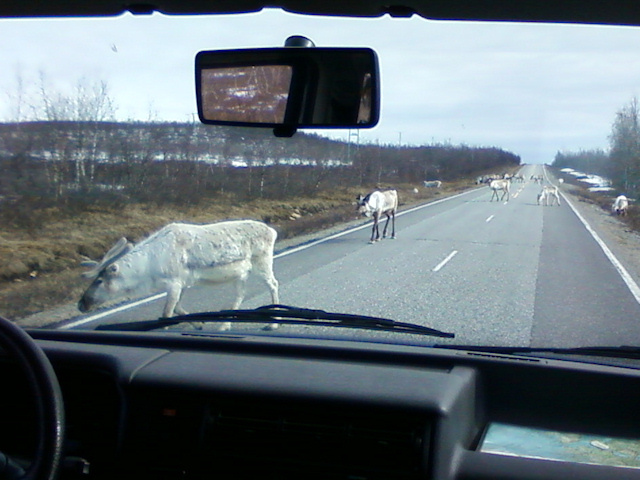 It also depends somewhat on the time of year and the exact location, as the roads tend not to have reindeer about quite as much during the depths of winter... but then there are other hazards. As a result, drivers need to take extra care, and always look ahead to make sure they can stop in time for these beautiful (albeit road-foolish) creatures.